Tom Philpott at Mother Jones blames food price increases since 2007 on financial speculators. He is quite harsh on the fools like me, who thought rising food prices reflected resource scarcity. I don't understand how speculation could raise food prices for more than a few months. The financial speculators are placing bets on the futures market. If they expect prices to go up in January, they will buy a contract today that guarantees them a certain amount of commodity in January. When January comes around, they sell their paper commodities on the ordinary spot market. If they are correct that prices rose, they make a profit, because their January sale is more than the price they originally paid. An essential feature of this game is that the speculators do not want to take possession of a ton of corn or soybeans. For speculators, the game is not "buying and more buying," it is "buying and then selling." The buying drives up prices, and the selling drives down prices. Commodity futures are different from "dot com" stocks, which can be held for a long time. Basically, I find it much more plausible -- as an economist and as an environmentalist -- to see rising food prices as a symptom of real resource scarcity. But I'll keep an open mind. Can somebody explain more clearly: beyond the first few months of a speculative boom, how can financial speculators keep driving the price higher and higher? Mark Bittman's column this week in the New York Times argues that junk food is not really cheaper. For a reader who is skeptical, Bittman's rhetorical method is to provide an array of examples, each of which has different advantages. The column concludes with both a cultural agenda and policy prescription. Do you like one, or the other, or neither, or both? 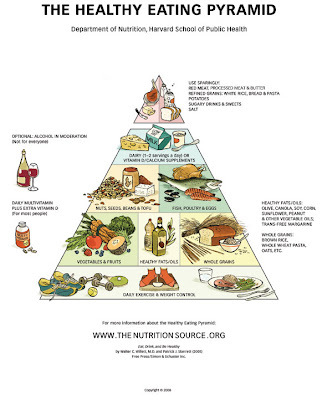 ... clearly was based on USDA's first pyramid graphic. Harvard's experts in nutritional epidemiology agree with USDA's graphic designers on many key points. Still, the Harvard researchers do make some distinctions. 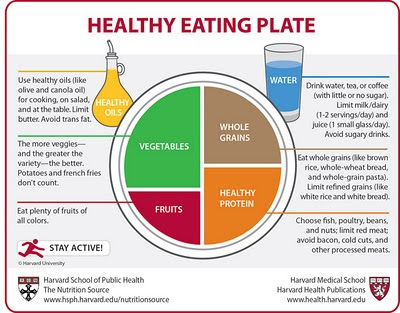 One difference is that Harvard's new plate graphic requires 2 times as many words to communicate its message [Update, same day: edited the number of words to count USDA's accompanying text]. 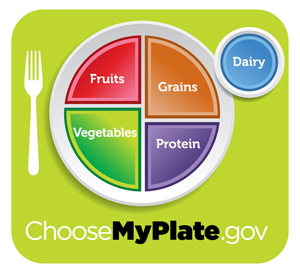 This may be helpful in dietary guidance targeting audiences with strong reading skills. A second difference is that Harvard's new graphic substitutes water in place of dairy as the beverage placed outside of the plate. The Harvard plate is more austere than the earlier Harvard pyramid, which was accompanied by a wine glass, and which also emphasized dairy. The wine and the dairy are now gone from the new Harvard graphic. A third difference is that the new Harvard graphic includes what looks like a very large amount of salad dressing oil, while recommending limits on red meat. I see nutrition merit in the Harvard graphic, but wonder if it is more successful at emphasizing distinctions with USDA than at communicating dietary guidance to a general audience. Obama Foodorama this week links to two rap videos showing Black people abusing their EBT cards from the Supplemental Nutrition Assistance Program (SNAP). The videos exploit every possible racist stereotype for a laugh. Some journalists are accepting them as straightforward satire, by artists who are themselves African American, but self-directed satire is not the whole story. The conservative media is giving lots of attention. The Drudge Report on Monday linked to the first video, by Mr. EBT, showing the singer buying junk food with an EBT card belonging to somebody else. Fox News covers the same story. The second video is far worse. In it, the singer Latoya "Chapter" Hicks adopts the fanciful character of Keywanda, a foul-mouthed, sexaholic, beer-swigging, chain-smoking Black mother of 10 children. She sings that "all you gotta do is f---" and 9 months later you get lots of government benefits. Chapter's website, which hosts the video, and "Creative Indie Artists," which produced her song and video, are both projects of Christopher A. Jackson, a White man from California whose other job is as an executive for KROQUE, a military apparel contractor. 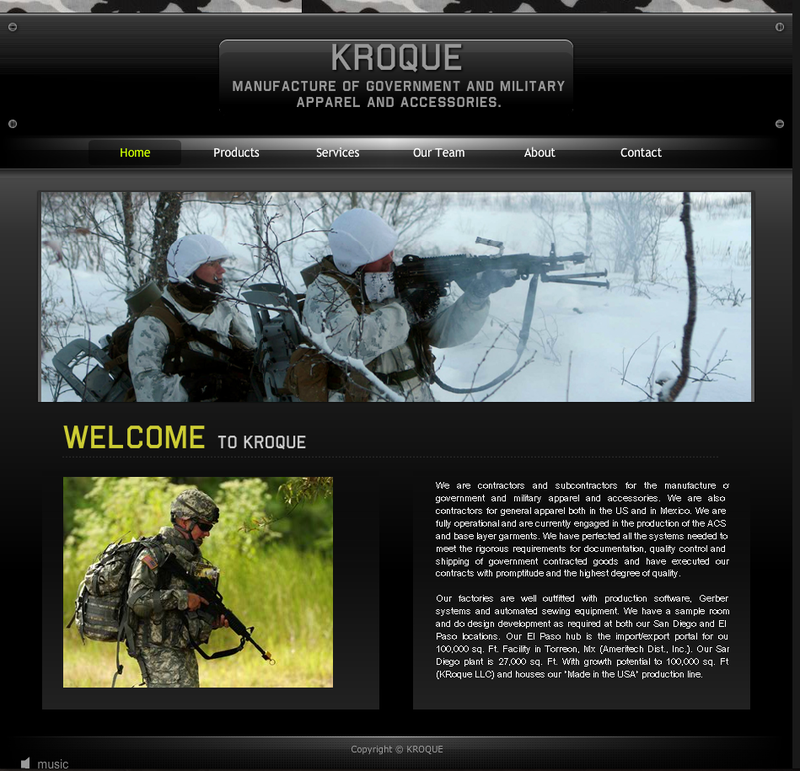 The Fact Evangelist found the link to the apparel contractor raised questions about the origin of this music project. Digging a little further, I found an old MySpace page for Christopher Jackson. Chapter and I wrote the lyrics and Chapter produced and arranged the song. She is releasing another video this Saturday 9/24 and will continue to release a new video each month. 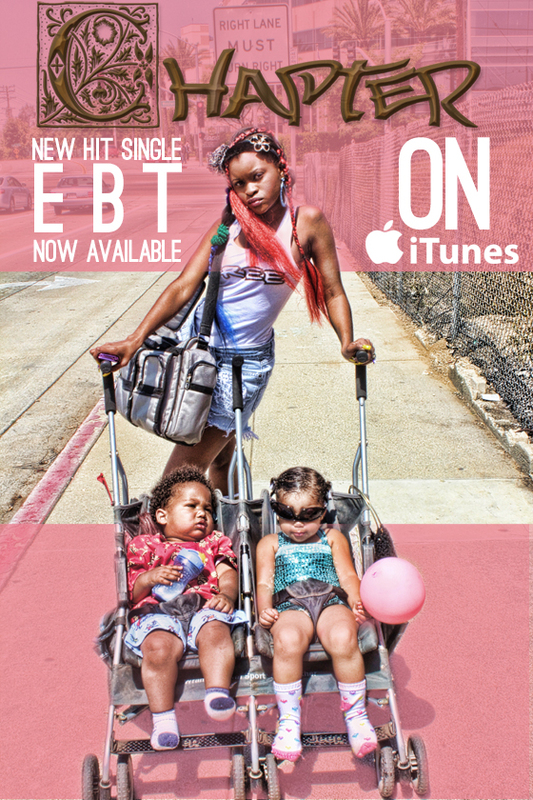 When I asked if this was hard-hitting anti-welfare social commentary, Jackson described the video as "a hard-hitting anti welfare-abuse-program pro social lesson." An Ohio blog discusses whether the Chapter video is racist. This whole episode reminds me of the tiff in May, when Newt Gingrich called Obama the "food stamp president" and then successfully parried accusations that he was tooting a racist dog whistle. The episode also brought to mind something very strange that I had noticed in the readership logs for this blog. One of the highest-traffic posts in my archives is an old post about race and food stamps. It turns out that hundreds of people on the internet are Googling the topic "race and food stamps." Try it yourself and you can find truly depraved and racist discussion lists. I hope Obama Foodorama and others who link to these videos will explore them a little further than they have so far. Because these videos purport to be satire, I know I run the risk of seeming humorless. But I'm not laughing yet. So how should you eat as a responsible global citizen? Consume less meat and oppose Western farm-subsidy programs -- especially if they focus on livestock. Campaign against U.S. biofuel programs, which divert corn into grossly inefficient energy production. Embrace further testing and analysis of GM crops. Encourage public funding of research and intellectual property laws that ensure that poor farmers are not priced out of the potential benefits of GM seeds. Spend only on organic food that is as energy- and land-efficient as conventional production. And be a smart consumer: Local produce grown out of season and meat raised on imported feed isn't friendly to you, the environment, or the developing world. Regarding the last sentence, it is important to add that local produce grown in season and local meat raised in an environmentally sound way are a true gift. One of the most exciting developments in all of U.S. food policy in recent years has been the experimentation, initiative, and entrepreneurship of the local food movement as an alternative to the most over-processed and unhealthy excesses of industrial food production. I could imagine the scope of local food consumption in rich countries doubling or tripling without any notable sacrifice in the efficiency of the food system as a whole. It would be a good thing for the world. The sad thing about Kenny's article is the road it takes to reach this final paragraph. Read the snotty tone of his exaggerated, overly broad, and fundamentally unsupported dismissal of the local food movement as a whole: "these First-World food fetishes are positively terrible for the world's poorest people." What is he trying to say by throwing some German into his criticism of "locavorism and organics über alles"? These passages of the article are harsh and pointless. I wish that the same writers who have the insight to write a balanced paragraph about environmentally sound eating also had the courage to resist the demands of our tabloid media culture. charlesjkenny Charles Kenny . @usfoodpolicy OK with conclusion to Got Cheap Milk but thinks middle is snotty. May well have point about middle. What foods fail to meet new voluntary standards for marketing to children? In response to a request from Congress, a federal interagency group has proposed new voluntary standards for what foods can be marketed to children (.pdf). A food industry campaign believes the voluntary standards will become essentially mandatory in practice, raising the industry's fears of regulatory overreach and loss of first amendment rights. Other legal experts on public health law and policy emphasize that the proposed standards really are voluntary. My own instinct is to see voluntary standards as a reasonable compromise between empty wishes for self-regulation and heavier mandatory regulation. So I am tempted to see the industry's legal concern as overwrought. But that still leaves open the question of whether the proposed nutrition standards are too weak, just right, or too strict. Marion Nestle says her initial reaction was the the proposals were "much too generous." The food industry's "sensible food policy" coalition says the proposed standards would prohibit marketing for nearly all commonly consumed foods. In other words, the industry thinks the nutrition standards are too strict. Now, here comes the arcane and detailed part of the post. The industry group listed 100 commonly consumed foods (.pdf), and claimed only 12 of them met the standards. The acceptable foods included fresh fruits and vegetables. The industry group's table lists 100 comparatively broad food categories (column A), and then picks a particular food within each category (column B), and then in most cases claims that the particular food failed to meet the federal proposal's voluntary standards. Some of the failures seem totally reasonable. For example, nobody thinks donuts or cake should count as healthy foods. But, the industry group claimed the standards also excluded popular and reasonably healthy foods. For example, in the category of "all family cereal," the industry picked one particular cereal, and said it would be "banned" because it had too much sodium. At first, I suspected the group was cheating, by picking "column B" foods that did not really represent the broader "column A" food category, but I was mistaken. I suspected the group of picking unusually unhealthy foods that failed the standards, just to make the standards look unreasonable. However, after questioning a representative of the sensible food policy coalition by telephone today, and working through the details for the cereal example, I had to retreat a bit. For example, unsweetened cheerios and corn flakes really do fail the proposed voluntary standards for sodium in the long run, even though one could argue that it is possible to have a bowl of cheerios every day and still meet the Dietary Guidelines recommendation for sodium (the cheerios provide 190 mg of sodium per serving, relative to the daily recommendation of 1,500 mg). In the short run, the proposed rules would be more permissive, allowing cheerios for a few years. The long-run voluntary standards use a fairly strict criteria that the marketed foods should qualify as "low sodium," which excludes cheerios. For myself, I would have been happy if the proposed voluntary standards had allowed cheerios and ruled out highly sweetened cereal. Perhaps the federal interagency working group was pushing the envelope on the details of the nutrition standards? The Rudd Center at Yale offers a new website called SPARK -- Supporting Parent Advocates with Resources and Knowledge. Whether you are a seasoned advocate or just getting started, SPARK provides parents with suggestions for building community, garnering support of key stakeholders, gathering information, and proposing policy changes to make school food healthy. A highlight is the helpful Questions and Answers page, which could be a great help for newcomers to these sometimes-arcane programs. Beginning this month, I will start a journey across America working to actively change the physical activity and food environment across the country. America is at a crossroads.With over 67% of Americans either overweight or obese, the nation is facing a problem of epidemic proportions. Beginning in Kenai, Alaska and traveling east to Brodheadsville, Pennsylvania, the StrongWomen Across America tour will focus on eight small communities with active StrongWomen programs. Each community has developed what I call a Change Club – a group of 15 to 20 motivated women who will work to change the physical activity and food environments in their own communities. It is my hope that this work will not only impact those individual communities, but will create a ripple effect that will reach communities across the nation. 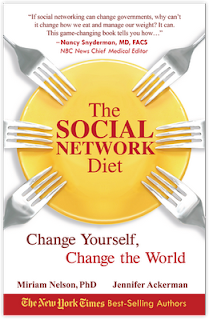 Mim's newest book, with Jennifer Ackerman, is the Social Network Diet. Since the 1990s, it has been illegal to sell raw ground beef contaminated with one particular strain of bacteria, called E. coli O157:H7. Almost any other type of pathogen is allowed for sale in raw beef, unless it actually causes an outbreak of illness. The food industry has long argued that banning more pathogens would represent overreaching government regulation, because many pathogens (such as salmonella and other varieties of E. coli) are found on a significant percentage of beef sold, it would be expensive to get rid of all the pathogens, and the beef will be sufficiently safe if consumers handle it and cook it well. Under the new policy, if the six additional strains of E. coli are found on beef, the product need not be destroyed. Instead, the beef may legally be redirected for use in cooked beef products. The meat industry would in this case bear the cost of ensuring that meat containing these strains of E. coli is correctly channeled to the cooked meat manufacturing process. Congress is also looking at this issue. Helena Bottemiller at Food Safety News reports on legislation proposed in Congress that would broaden the definition of adulterated meat and egg products. "As goes profit, so goes the plow." The New York Times today explains the agricultural economics of the distinctive Gravenstein apple in Sonoma County, where the more dominant wine industry competes with orchards for scarce land. UC Davis economist Dan Sumner -- a great source of mentoring to me during my recent year of study in California -- has the funniest line of the article.